Are you a sauce person like I am? I literally put some sort of sauce, dip, or dressing on everything I eat! My absolutely favorite forever and always will be garlic sauce. Whenever I go to a Middle Eastern restaurant, I always request extras of garlic sauce because it tastes so good with literally everything especially the meat. Recently when I went to New Jersey, my mom made a bowl of delicious creamy garlic sauce. I asked her for the recipe and here it is! I made it the other day and have been putting it on almost all my food. It is that good! This sauce is the perfect compliment to Falafel sandwiches or Shawerma. 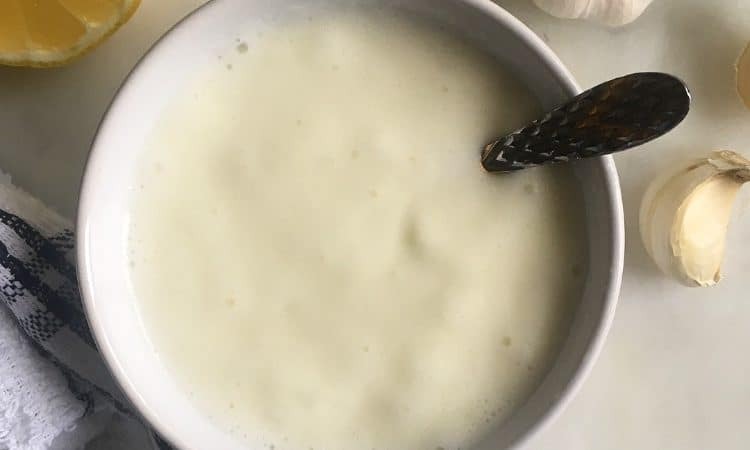 The consistency is more like a yogurt rather than a thick dip which makes it easily drizzled on food or used for marinade. It thickens as it cools in the fridge. This garlic dip also packs a punch. If you do not like garlic then this isn’t the recipe for you maybe Tahini instead? 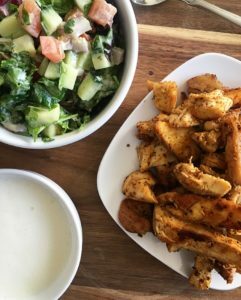 I have a great Tahini sauce recipe that I will share with you next time. Place garlic in processor along with salt and add half of the lemon juice. Blend and scrape the sides down. Add the egg whites and blend again. Steadily add half the oil into the processor. The emulsification process should take place by now. Sauce should not look separated. Continue adding the rest of the oil and the lemon juice as well. Do a little at a time of each till all done. At the end, add 1 tbsp of the cold water to the mixture as well. Do not pour it all in!